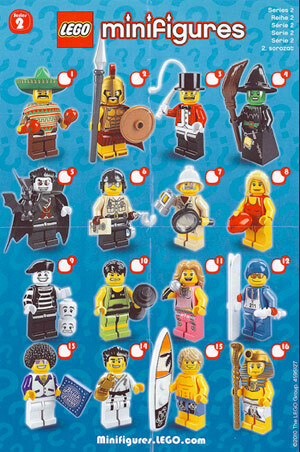 About a year ago I blogged about LEGO introducing the “minifigures” series. This last Christmas I bought a minifigure from series 2 for my brother. I didn’t feel around the packaging to guess its contents. He wound up with the worst figure in the series: the singer. Figures that I certainly did not want were put to the side, like the witch, weight lifter, and the police officer. Side note: If you want the witch from this series, then head over the Borders in Danada Square in Wheaton, IL. They have a ton. There was one package that I could not figure out its contents for the life of me. I was so intrigued that I bought it. Everyone at work guessed it was the disco dancer. I said it couldn’t be him because the hair isn’t circular enough. As I opened the packaged I pulled out the figure’s pink legs and disaster struck. It was the exact same figure my brother got: the singer. Distrust, then anger and finally dissatisfaction settled in. Now I am determined to visit another Borders to get the sombrero man. What is #8 on this poster? That looks like the worst one. 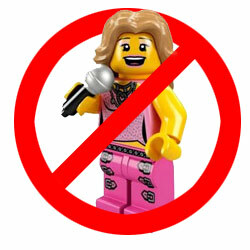 At least the singer one might be fun for kids. They could pretend to make their singer sing. Oh rapture yes. This is the exact reason I was born. To find you, my long lost blogger soul-mate.